Resumes are still one of the most commonly used tools by HR departments to screen candidates for an entry- or mid-level position. However, this is practice is outdated and inefficient. More often than not, what’s written on a resume cannot accurately portray an individual’s knowledge and capabilities in a working environment. Perhaps that’s why recruiters never rely on a resume alone when hiring for C-suite positions. If you ask anyone who has managed the hiring of individuals, you will find that there are lots of times where someone looked great on paper but when it came to actually performing, they simply didn’t have the right skills or were the wrong fit for the role. The information in a résumé is the least reliable predictor of success in a job. Anyone can look great on paper if they know what they are doing and if they use the right words. Even if they are entirely truthful when listing their experience, education, and accomplishments, a resume simply doesn’t provide the right information to determine whether they are the best fit for the role and the company. Instead of focusing solely on a resume, do what human resources professionals do when evaluating C-suite candidates; focus on who they are as individuals and how they interact with others in the workplace. These tactics are commonly used to screen applicants for high-level positions, where finding the right fit is critical to long-term success in the role. With so much at stake when filling C-suite vacancies, there is little room for error. Recruiters have to not only find the right person who can get the job done, but they also have to fit in with the company culture, inspire innovation and dedication in others, and lead the organization into the future. Aren’t those attributes we should seek in every employee, for every role? At TalentSorter, we call that the FitFirst Philosophy. When you focus on the right fit, rather than the right resume, you spend less time screening and interviewing candidates, reduce turnover, increase productivity and performance and boost employee engagement. 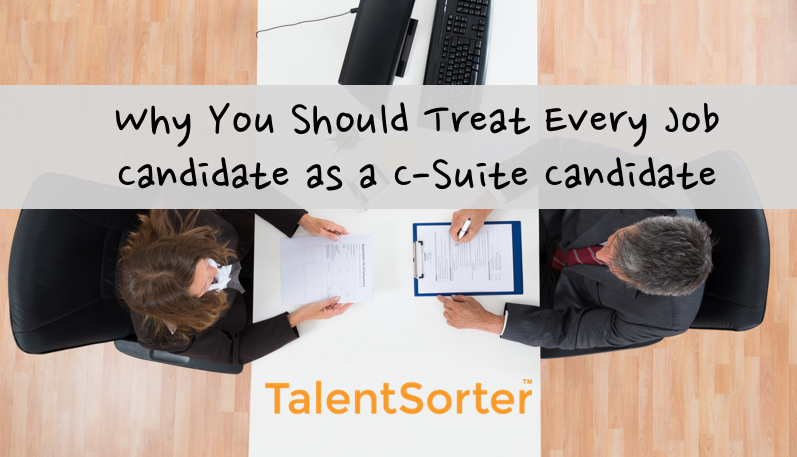 Treat every hire like a C-suite hire and focus on fit first.